Landin's Computing machine is a chain adder of the type, invented in 1670s by Claude Perrault. It was invented around 1890 by Peter J. Landin (Mar. 9, 1858–Jan. 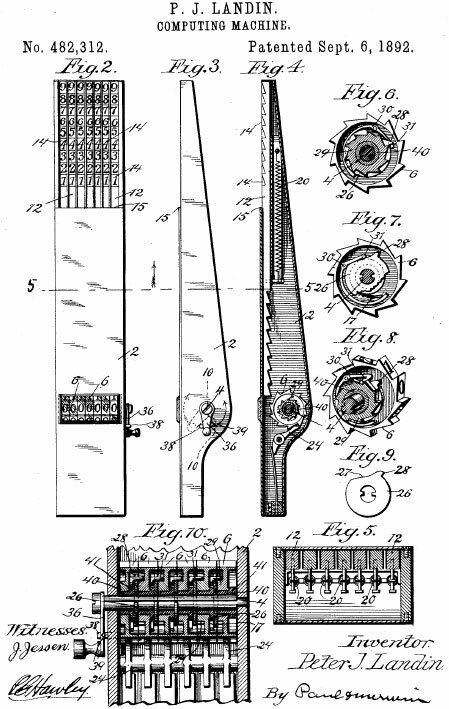 24, 1940) from Minneapolis, Minnesota, who took out a US patent №482312 on 6th September, 1892 (see the upper patent drawing). The device (see the nearby photo) was manufactured 1891-1895 by the company of the inventor—Landin Computer Co., Minneapolis, under the name Landin Computer. Later in the end of 19th and the beginning of 20th century it was produced by the Rapid Computer Co., Benton Harbour, Michigan, under the name Rapid Computer Adding Machine. The price in the beginning of 20th century was $25. Since 1909 a slightly improved version of the device was produced by Schubert&Salzer in Chemnitz, Germany, under the name Comptator. In 1922 the production was transferred to Hans Sabielny, Dresden, Germany, and the Comptator had a good market success. The Landin Computer is a seven digital positions slide-chain adder operated with pin or pencil. It is a well designed and manufactured device, with robust and reliable construction. Dimensions (mm): 60W x 205D x 32H; weight: 750 g.
The stylus is inserted in the toothed slides in the upper section and is drawn down to the stop, advancing the register by the corresponding number of places. The slides remain in their final position, so that the value entered can be read back for verification in a straight line above the stop. The slides spring back to their home position when released by the lever on the left-hand side. The lever can be latched down to give an immediate return if checking is not required. Peter Landin is a holder of several other US patents: for cash registers and recorders (patents with numbers 482014, 526400, 526401, 526402); for a phonograph, №1422453; for a motion picture film, №1234046, etc. For the patents of cash registers Landin worked for the prominent Walker family, a highly successful American businesfamily, who built one of the largest forest products corporations in the USA at the time (Fletcher Loren Walker (1872-1962) is a witness of the first and a co-holder of the other patents, assigned to his father, Thomas B. Walker).